I have very few store bought guilty pleasures that I not so secretly love, and have loved ever since I was a kid. Zebra cakes, frosted circus animal cookies, powdered sugar tiny doughnuts and those Danish butter cookies that come in a blue tin are my all time favorites. I’m obsessed. Now I know they’re not healthy treats, and who really knows what kinds of crazy unpronounceable ingredients they have, but I can’t help it, they remind me of my childhood. In my defense, it was the nineties and no one was really scared about crazy chemicals in food back then (or at least I don’t think they were). It was a different time, for sure. Don’t judge me! I’m sure I’m not the only one out there with guilty food pleasures. Sure, I’m a baker and I can easily make any dessert at home, but no matter what I do, those treats up there are irreplaceable. I’m not saying to go out and eat these cookies, cakes and doughnuts every single day, but I am saying it’s totally okay to treat yo’ self every now and then. You deserve it. 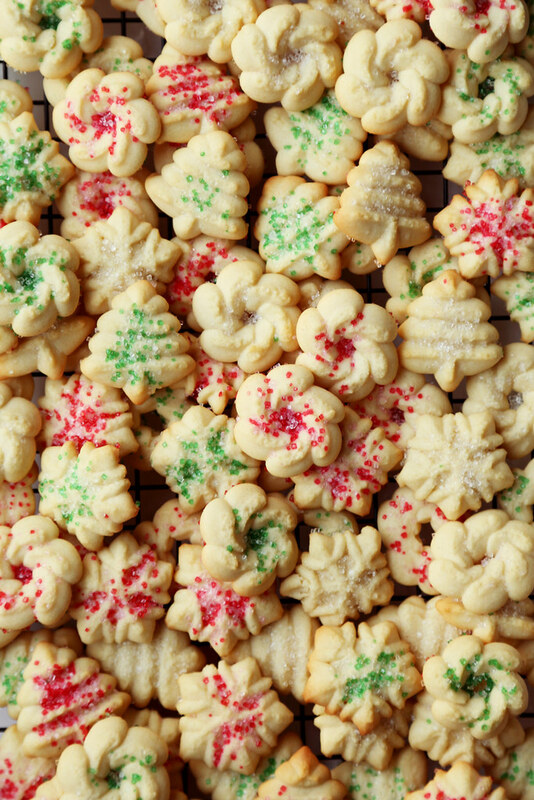 I most commonly get a craving for Danish butter cookies during the holidays. Maybe because that’s when I see millions of those blue tins around grocery stores everywhere. My favorites are the wreath shaped ones and the small pretzel shaped cookies. Those are the best. I recently decided it was time to make my own version of those cookies at home. I browsed online and found that I’m not alone in this Danish cookie fascination. I was lucky enough to find lots of recipes on the internets that I was able to piece together a few to make the ultimate butter cookie recipe. It’s great because they’re made with everyday ingredients that you (most definitely) probably have on hand already. No need to take a trip to the grocery store for anything fancy. Well, maybe just sprinkles but you know what, that’s totally worth a trip to the store because these cookies need to get they’re sprinkle on. With the holidays around the corner, I think they fit perfectly with the season. 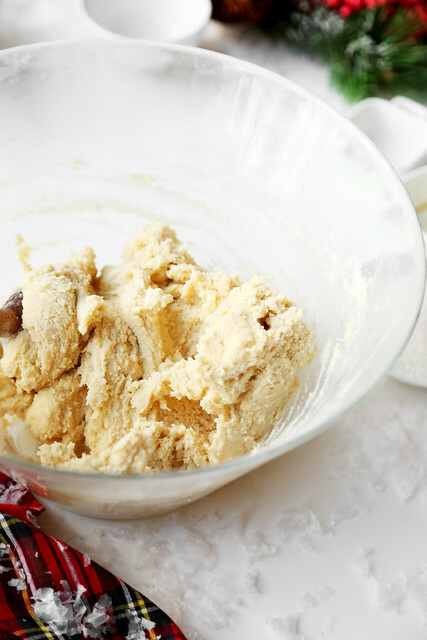 Plus, who doesn’t love a good cookie recipe in December? 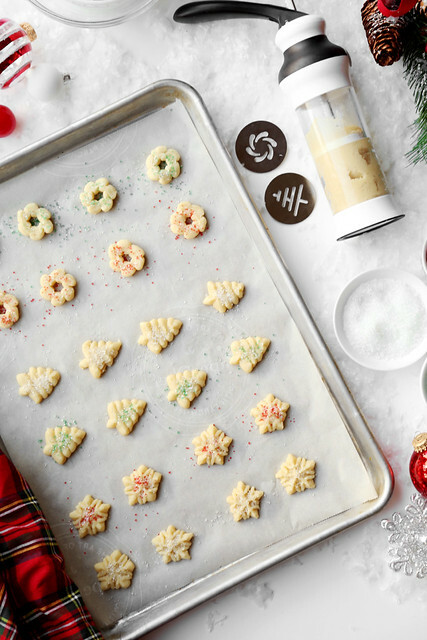 Let’s get into the holiday spirit and whip up a big batch of these cookies and make it rain down the most delicious buttery treats you’ll ever encounter. Let’s also run down to the grocery store, while we’re at it, and try those guilty pleasures I mentioned earlier. Let’s keep it just between us and not tell anyone that we’re living our lives. Most importantly let’s have a good holiday season filled with lots of guilty pleasures! 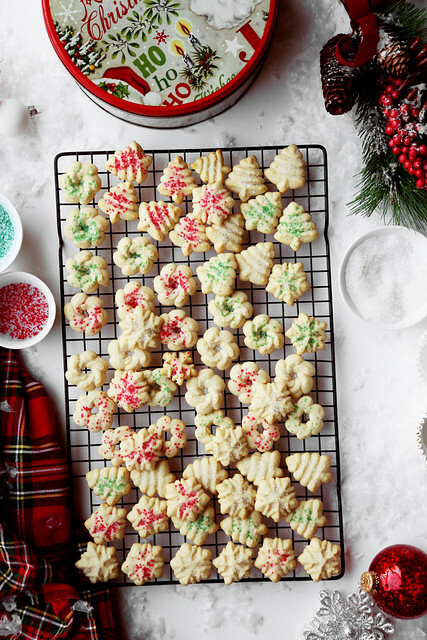 These cookies are incredibly easy to make, and only require a handful of ingredients that you most definitely already have on hand which makes them even better. I love the fact that I can make them at home and no longer have to eat the store bought cookies anymore because I don’t know exactly what goes into those. That means I could eat more of these cookies because they’re better for me! It’s a win win. We start by creaming together the butter and sugar on high, until light and fluffy for about 5 minutes. Then stir in the egg, vanilla and milk. Mix until evenly combined. You can mix this by hand, using a wooden spoon and a lot of elbow grease, or you can just use a mixer and have it do all the work for you. That sounds like a better plan, doesn’t it? 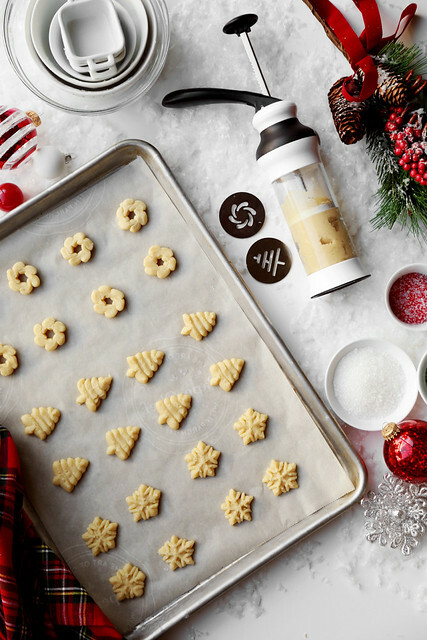 Fill a cookie press with the dough and press out cookies (using the different holiday plates) onto a parchment lined baking sheet. You might find it a little bit difficult for the dough to stick to the baking sheets. I had a hard time so I pressed them out onto a baking sheet without the paper (or a counter top works fine too), and then transferred them to the prepared baking sheets using a metal spatula. 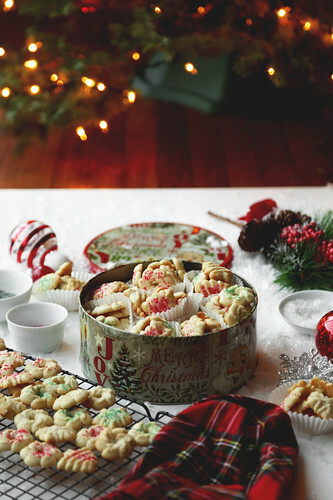 Sprinkle the cookies with red, white and green crystalized sprinkles. I found them at my local craft store, but any holiday sprinkles will do. 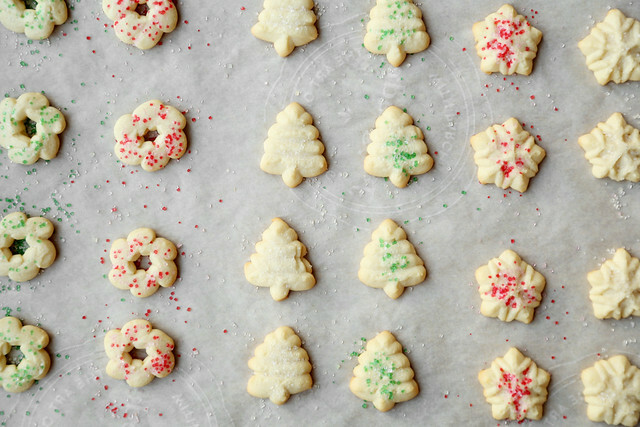 You can also omit the sprinkles, and just top the cookies with granulated sugar instead. That’ll work as well. Since the cookies are tiny, they don’t need that much space to spread, but make sure they do have some wiggle room. I fit twenty-four cookies on each baking sheet, which is really nice because I was able to bake them off a lot faster than I would any other cookie. Bake in a preheated 350ºF oven for about 8 to 10 minutes or until lightly golden brown around the edges. Remove from the oven and allow to cool for about 5 minutes before transferring to a wire rack to cool completely. 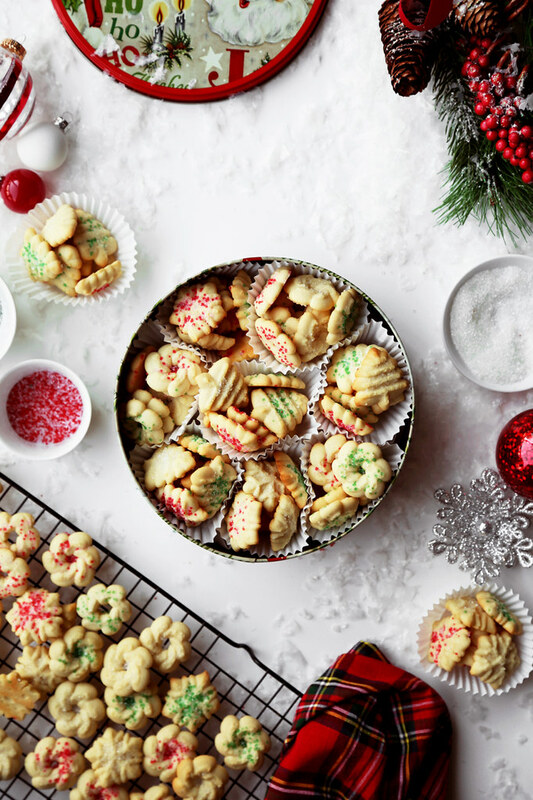 Once all of the cookies are baked, and completely cooled and you’ve managed to sneak a few here and there every now and then, place the cookies (about 4 or 5) into cupcake liners and then place the liners in a holiday tin. It’ll make them look just like the holiday Danish butter cookies sold in the store. Plus, you’ll look like a rockstar if you go to a party with this tin in hand, filled with butter cookies. Everyone will want to be your friend. Get ready. I love these cookies because putting them in the tin not only keeps them fresh, but it instantly makes them super fancy. 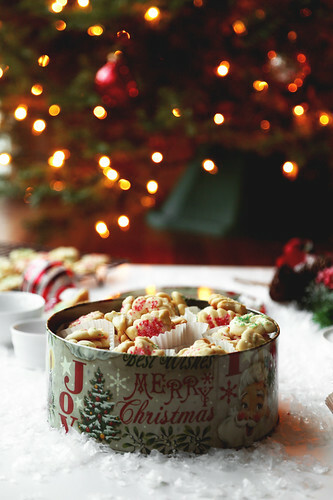 You can put the cookies into smaller tins and hand them out as holiday gifts. I’m always a strong believer that it’s not about how much money you spend, but rather the time and effort you put into the gift itself. A gift from the heart—like something you’ve made with your hands or baked/cooked for someone special—means a whole lot more than something you can buy at the store. I have to tell you that it takes a lot to impress my middle sister. She can be a tough critic when it comes to food. The girl knows what she likes and definitely knows what she DOESN’T like. Believe me, I’ve learned the hard way. She came over my place this past week and I offered here some of these cookies. She became addicted, instantly. I’ve never seen her eat that many cookies, to the point where she demanded more of them the next day. So take it from my sister, these cookies are good. Really good. I want everyone to know that I’ve made it my life’s mission to eat as many of these cookies as I possibly can before Christmas. I’d tell you to send help, but for some unexplainable reason, I don’t want to be helped out of this one. All I want to do is just eat all of these cookies everyday for the rest of the year. After all isn’t that what the holidays are all about? Yes, yes it is. We both still have time to get it together and eat everything in sight. 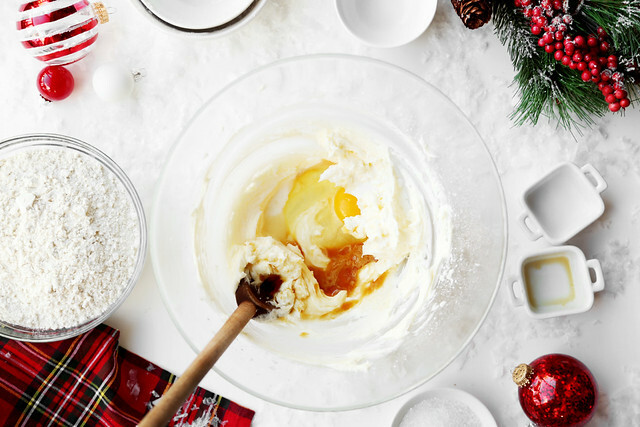 You go ahead and start that holiday baking because before you know it, you’ll be knee deep in sugar, flour and butter in your hair and you’ll be wishing you had a head start earlier. Enjoy and Happy Holidays! 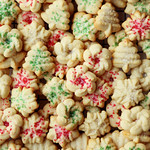 A super easy recipe for Holiday Danish Butter Cookies just like the ones sold in tins at stores! 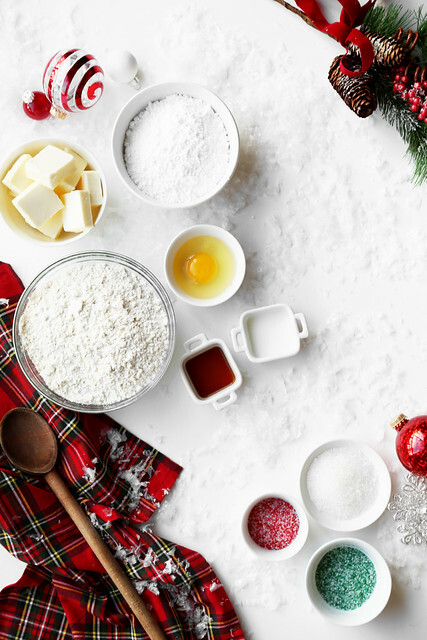 Celebrate the holidays with only a handful of ingredients! In a large bowl, cream together the butter and powdered sugar on high until light and fluffy, about 5 minutes. Mix in the egg, vanilla, and milk. Stir until evenly incorporated. Add the flour and salt and stir until the dough comes together. It shouldn't be sticky or too wet. If it is, just add a bit more flour until the dough is soft and only somewhat moist. If it's too dry and doesn't come together, add a splash of milk. Place the dough into a cookie press and press out onto prepared baking sheet. You might find it difficult for the dough to stick to the parchment paper. I found it really hard, so I pressed out the cookies onto a dry, room temperature baking sheet without parchment paper (counter works too) and then transferred them to the prepared baking sheets with a metal spatula. Sprinkle the top of the cookies with the sprinkles. Bake for about 8 to 10 minutes until lightly golden brown around the edges. Remove from oven and allow to cool on the pan for about 5 minutes. Transfer to a wire rack and allow to cool completely. 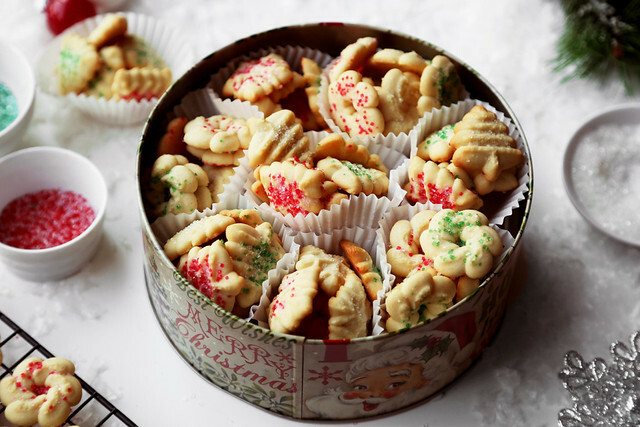 Store the cookies in a tin at room temperature. Will keep for up to a week. Enjoy! Hi Jonathan, first time commenting (but long time lurker 😉 thanks for this recipe, I am surely going to give it a try very soon! I just love these. So cute on a cookie tray! 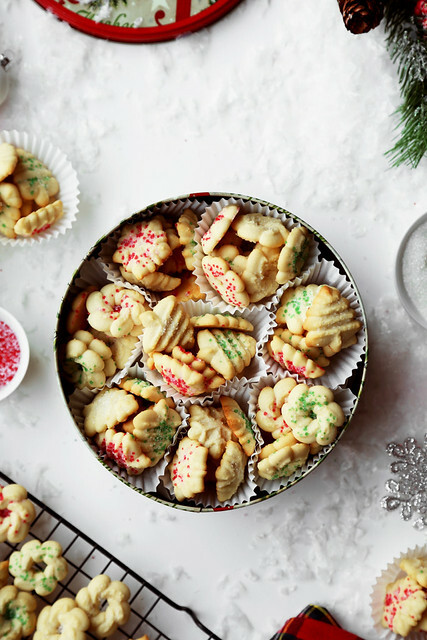 These bring back memories of the Christmas cookies I had as a kid – love this! Mmm these look amazing Jonathan! those are my 4 store bought guilty pleasures too. TWINS. These little babies look delicious I cannot wait to make them! Or did you not know that I was 3/4 Danish? i do not normally leave comments on blogging sites but i just could not stop myself from writing this….i was searching for some cookies which i could make for everyday use which my family could have in the morning with their cup of tea which is not very fancy or chocolaty and could store well,and then i remembered about some danish cookies which brought me to your blogs. i also generally do not bother with all the things written before the recipe comes but i read what you wrote. it really is a long post but i just love that it includes so many pictures. in most of the blogs all you can see is the end result but you do not know what you are doing is correct or not and your blog serves that purpose.and your sense of writing is funny and sets you apart from the others. and by the way these cookies look super cute. can you also post a recipe for puff pastry,keeping in mind about tropical countries super hot temperature and how can i avoid the butter to melt instantaneously while making it. Love this recipe,I will defiantly try this.But I would like to know if I could use salted butter instead of unsalted. Feel free to use salted butter! Just omit the salt from the recipe! Here ya go! Sorry for the late response! I hope you enjoy them! Oh I do hope these taste just like cookies in the tins, because I CAN’T FIND THEM IN THE STORES THIS YEAR!!!!?!?! I think they do! But I might be slightly biased….I highly recommend!